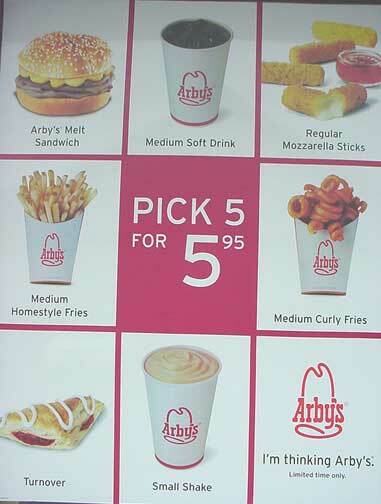 Visual communication requires attention to layout, among other things. 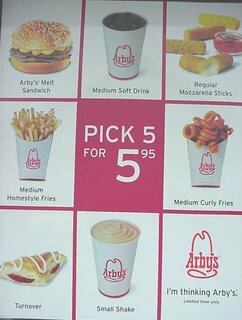 I don’t know how many people looked at this poster, displayed in the window of an Arby’s restaurant, but none of them were thinking. It matters where you put the words. 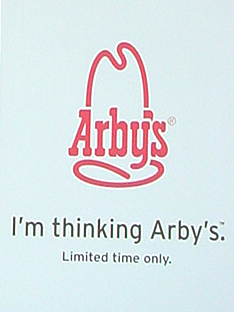 Does Arby’s only want me to think of them for a limited time only? I rest my case. Before you display, print or send -- read what you’ve written. It’s not lean if you sabotage your own communication goal. 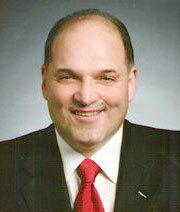 Michael Guido, long time mayor of Dearborn Michigan, died this year of pancreatic cancer at the age of 52. Mike deserves a tribute here as a leader of a community. I didn’t know Mike, and don’t live in Dearborn, although we both worked at the Society of Manufacturing Engineers at different times. Mike’s leadership is reflected in the memories shared by friends in our local paper. They are mostly of small things that any leader can do. Some leaders may want to add little acts like these to their New Year’s resolutions. Lily Amen was head of the PTA in the 1980s. The kids desperately need a place to play, and she was getting no action from the city’s recreation department. She went to Mike. “He came through is less than two weeks.” He helped build the playground and visited and played games with the kids. Mary Jane Happy, editor of the paper’s “Parent Talk” column told of when the mayor chaired the U.S. Council of Mayors’ advisory board for science progress. He declared the city’s “science in the school day” initiative, and as part of it, visited a third-grade science class. He sat down with the kids to lead them in building a gumdrop dome to see how much weight it would carry. It was a challenge to keep the kids from eating the gumdrops, Happy said, but the kids learned that triangles were stronger than squares. “My Way,” was Mike’s favorite song, and he sang it when he was inaugurated as president of the U.S. Council of Mayors in June this year, not long after he learned he had cancer. Despite chemo and illness, Mike carried out his duties as president until he came close to the end of his life. Reporter Gary Woronchack said Mike was known to stop and pick up a piece of paper littering his city’s sidewalks, and that Mike was seen early some mornings sweeping the street in front of city hall. No cameras around, either. Even so, Woronchack said, Mike could steer a multi-million dollar project like the new Ford Community & Performing Arts Center. 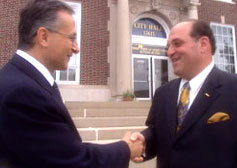 Mike supported the city’s large Arab community before September 11 and since. There were no ugly incidents. He joined the ACLU and ACCESS, the city’s local Arab community group, in assuring that no Arabic men answered a night-time knock on the door for a trip to an FBI questioning. Letters had to go to any of these men in advance of a “meeting” and they had to be assured that bilingual and legal advisors could accompany them to any such interviews. Hattie Bryant, founder and producer of weekly PBS TV show, “Small Business School” spoke to Guido when she profiled Ahmad Chebanni, (with Mike in picture) business owner and a founding member of the American Arab Chamber of Commerce. She asked Mike why the Arab American business community important to the city of Dearborn. “You're a visionary,” said Bryant. And you had to have lived here, watching blight creep from Detroit to the east side of Dearborn, to appreciate what the Arab-American community has done to revitalize the area. The work was done by the residents and business owners, but the mayor’s support was critical to success. Mike participated in an annual school clean-up day when residents and students would clean, fix up and paint 20 community public, parochial and private schools. He read to kids during Reading Month, making faces to get the kids laughing. Dearborn Public Schools Superintendent Jeremy Hughes said “He helped get new schools built, he helped get Federal money for programs the city got national recognition for.” DPS school employee Jacqui Rivait said Mike was at a sports banquet and asked the team managers and statisticians to stand up for recognition along with the players. 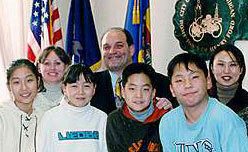 Mayor meets Korean students visiting the city during their immersion program in Dearborn. Laughter and his penchant for telling jokes were remembered by one person after another in the newspaper’s interviews. He was remembered as a friend, neighbor and parent by people all over the area. Hundreds crowded Sacred Heart church for his funeral, and all seemed to feel his death was a great loss to Dearborn. Although he left a loss, I think he left something more. Everyone he touched will be a little more human and a little better citizen through his influence. And from his example, we can all learn to be better leaders.